Imagine owning this gigantic non-commissioned salesman. This gorilla is HUGE! Standing three stories tall, he can be seen from over a 1/4 mile away. Be careful installing him on a roof, he must be properly anchored with at least four good anchor points. He has four 2" D-Ring tether points on the front and four on the back and additional tether points on his feet to keep him secure. No scary teeth or mean face, this gorilla is inviting to customers. Stand out from your competition today. Made in the U.S.A. so you know you can trust the quality, we warranty all of our cold air inflatables for a year here in Atlanta, GA. We stand behind our quality. We are a custom manufacturer of high quality outdoor gaint advertising inflatables. 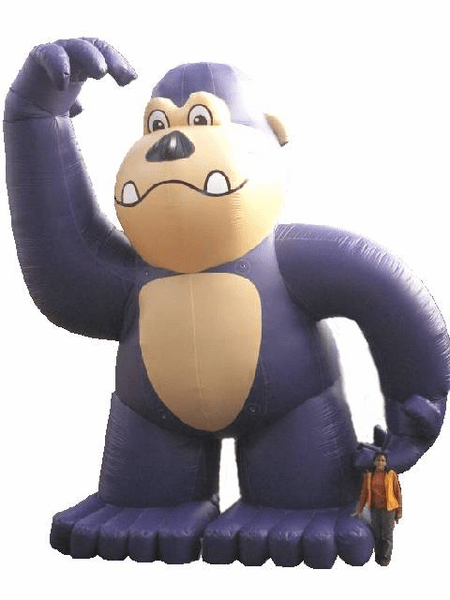 We can custom make any inflatable to resemble any character or logo. We have very fast turn around time because we are the manufacturer and do not outsource or resell. We sell air blown dancing tubes and guys as well as giant rooftop, hot air shaped balloons. We custom make banners for these balloons. We make giant gorillas and any character. We also repair any inflatable including inflatable jumpers, slides and obstacle courses. www.inflateonline.com covers USA, Canada, Puerto Rico, Chicago, Atlanta and Houston : - custom inflatable ad blowup.